The origin of coffee is very ancient, the long journey begins in Ethiopia. The coffee bean has taken several centuries to make the round of the world and conquer it. We have three hundred years of consumption and lifestyle associated with popular drink. Coffee ways are many, you can visit it through pictures and representative objects. 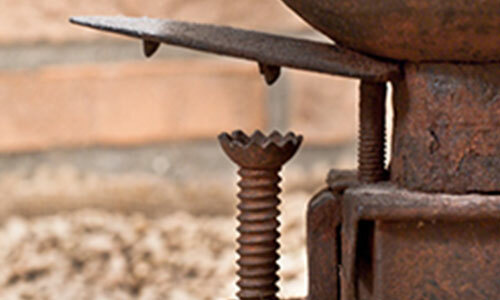 My focus is on coffee grinders, the history and the art of grinding have always fascinated me. The date and place where this object became its first appearance remains unknown, we know with certainty that the first ones to use it were the Arabs and the Turks. This tool was born and spread in the western world not so much for the need to grind coffee, but to cut some types of spices into thin powder. The oldest known spice grinder dates back to 1506 and is guarded in a French museum. The passage from the spice grinder to the coffee grinder took place in the 17th century, when coffee was introduced in Europe. To obtain optimal powder it was necessary that the grinder had to produce a medium-sized grain, that it was bigger and more stable and that it had a larger container for the ground. 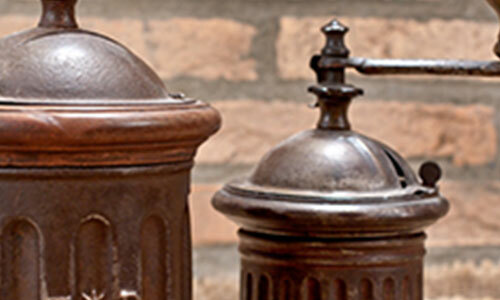 The first grinders were made in France, real works of art made by the best craftsmen on behalf of nobles. At that time coffee was a luxury that few could afford. In the first half of the nineteenth century the coffee grinder went into the houses of ordinary people; the industries began to produce it in the second half of the nineteenth century. In 1842, in France was born one of the most important producing companies of coffee grinders known with the famous “Peugeot” brand. 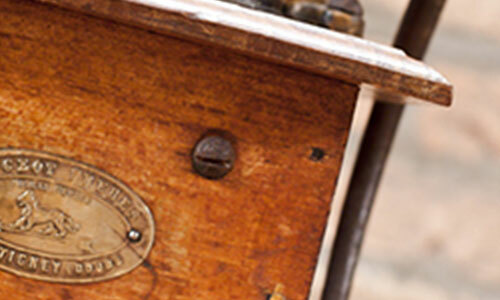 In Italy, Bertoldo brothers featured the history of coffee grinders with the famous “Three Spade” brand. The company was born in 1894 in the hamlet of Vigneto di Forno di Rivora (now Forno Canavesa, a small locality 30 km away from Turin). These companies, having seen the spread of coffee consumption, with the production of these tools gained a great success. In 1957 the hand grinder was replaced by the electric grinder; this has attracted remarkable success on the market. Unfortunately, today the electric grinder in homes has been largely supplanted by the sale of vacuum-packed of ground coffee.